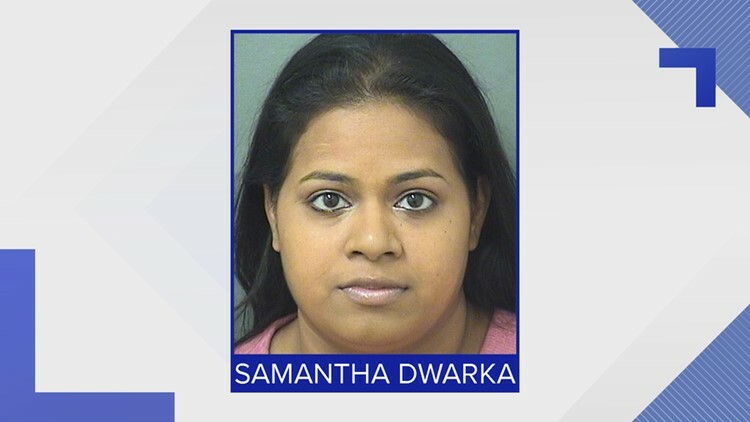 Samantha Elizabeth Dwarka is charged with two counts of cruelty to animals, two counts of felony cruelty to animals, and three counts of unlawful abandonment or confinement of animals. Samantha Dwarka is accused of knowingly leaving the pit bulls in small crates without exercise or sufficient air. WEST PALM BEACH, Fla. – A West Palm Beach woman is facing several animal cruelty charges after Palm Beach County sheriff’s deputies found four malnourished pit bulls in a shed near her home, according to an arrest affidavit. Samantha Elizabeth Dwarka, 27, is charged with two counts of cruelty to animals, two counts of felony cruelty to animals, and three counts of unlawful abandonment or confinement of animals. The affidavit states Dwarka knowingly left the pit bulls in crates inside a small shed, where they could not get exercise or sufficient air. "The air inside of the shed was stagnant and the smell of urine and feces was overpowering," according to the affidavit. A doctor found the dogs were underweight and tested positive for both hookworms and whipworms. Palm Beach County Animal Care took the dogs in, where they have received proper care and gained weight, according to the report. Other problems the dogs had were visible rib, shoulder and hip bones; hair loss and long nails.